1) YI "ZOU" WEI Y0NG. After so many years of study and practice of Baguazhang or "Eight Diagrams Palm Kungfu", if I really had to synthesize the whole art into one single sentence, I would use this: yi zou wei yong which simply means: "To consider walking around the circle as its usage". Because in fact, the whole essence of Bagua, from a martial point of view, can be found in this sentence. On the other hand, we will see in the second paragraph what its philosophical essence is, which is the basis for the martial essence. The purpose of a martial art is to defeat an opponent, both in attack and in defense. If we consider the approach of almost all the arts, we see that it is essentially linear, according to the principle that the straight line is the shortest distance between two points. Obviously all the arts also have the study of angles and they sometimes try to go around the opponent, but this is, in the last analysis, occasional. There are two arts that are tightly connected with Baguazhang and which are in fact part of the same family, Xingyiquan and Taijiquan: I will explain in the second part why, in my opinion, Bagua is, I think, superior or better than them, because Bagua, I think always, is inclusive in comparison to them. These two arts perfectly integrate with Bagua and, probably not by chance, often in every one of the three schools, we can find techniques or principles from the others. This, if we think about it an instant, makes us think about greater universality of these arts in comparison to others, of greater integration of them with the freedom of things. But this is philosophy, we will talk about it later. Returning to real practice, personally I find that in the field of the various schools of Bagua there is great confusion when we talk about its practical side. I am not of the opinion of those people who, especially in west and particularly in the field of Bagua, tell you: Baguazhang, in its formal content, is only an expressive potentiality, actual fighting is another thing. Now, it's true that, in comparison to a stylized expression, fighting is always another thing. How could it be otherwise? Taking an example that is often used in the field of martial arts, it would like trying to write a new, free, text or writing, using only dictated sentences one would have previously received. It is obvious that the new text would have a false, artificial, character. In the normal procedure of learning in primary school, the first thing learned is how to connect together consonants and vowels and form syllables with them (even if often the opposite is done, as for instance I do - I am a primary school teacher - syllables give way up again to consonants and vowels), then finished sentences are received, then texts made of finished sentences (dictated) to finally attempt, armed with these tools, to create the free text. It is obvious, then, that in the martial arts the procedure is similar. For instance, we start with syllables (the basic stances), we go up again to vowels and consonants (the techniques), we do the dictated sentences (the forms) and we develop the freely written text (tuishou-tuisan, half-free and free fighting). In addition to the "language" we then have other subjects based on it (the use of weapons, an extension of the art). Is it in fact possible that the founder of Baguazhang, Dong Haichuan, universally recognized as a giant in the world of the martial arts, really developed his art as a kind of useless dance, derived from its presuppositions? It is obvious that this cannot be possible. But then, why is it that in the field of this martial art there are so many different approaches and often so contradictory? Let's take an example. Recently I read in a book written by one of my latest teachers, Zhu Baozhen, that the 64 linear forms cannot be considered Baguazhang. It is his opinion, a teacher's opinion, mainly from the school of Yin Fu, but others, in my opinion correctly, won't agree. Even I would not agree if the statement was expressed in these drastic terms: Baguazhang has in its roots the "disease" of change, the genes of change, therefore everything that historically was developed as Baguazhang should generally be acceptable as Baguazhang. Which doesn't mean that it's necessarily the best thing or that it hasn't distorted, somehow, the founder's intentions. A founder who expressed the meaning of what he taught in this simple way: YI ZOU WEI YONG, "to consider walking around the circle as the usage, that is the practical part." For years, after having learned the linear forms, I thought that "Laoseng tuobo" (the old monk lifts the bowl posture) was the most advanced bagua fighting position . 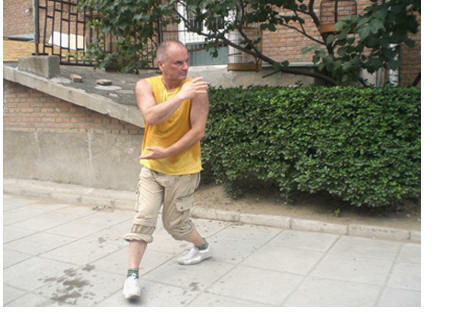 It is a frontal position (even if sometimes used on the circle), similar to the santishi of Xingyiquan. However, there remained always in me a sense of dissatisfaction: Where was the so much proclaimed "circularity"of Bagua if in the end a frontal position was mostly used? I often made in my mind the comparison with Longxing bagua tuishou, the pushing hands Dragon form created by Fu Zhensong, a two-man form that it is completely circular. Why wasn't this also the rule of application in the other schools? Naturally this doesn't mean that to practice Bagua it is necessary to continually walk around the circle: perhaps after some walking we would be dizzy; but the purpose of fighting Bagua certainly has to be to use its circularity to surround the enemy, not to fight him frontally as taught in the the linear forms. Therefore, something needed to be changed. So, after a certain point I started to change the formulations. Laoseng tuobo can also be done all right as a form of palm change but beginning from a circular position. In fact, if done with correct mechanics, Laoseng tuobo can be very useful and can develop a lot of spiraling energy (chansi jin) in striking. But, as I said above, the necessity of continuous change is in the genes of Bagua: can there be other positions that develop strength dynamics? For instance, the classical Bagua stance can be all right and work pretty well especially in defensive form: it is difficult to overcome the line formed by the two hands, one above and one low. While it is all right, in my opinion it is not so good as an attacking stance. Instead, there is a posture used in the eighth series of palms of Jiang Rongqiao Original Form (and whose origin appears rooted in the snake form of Xingyiquan) called Jinshe panliu (golden snake winds around the willow) which is more dynamic as an attacking stance. This is one of the positions we adopted. Still another position can be that of Yiquan, but done walking around the circle. Obviously, it must be stated that we don't become "fixated" in any of these postures, however valid, but we adopt the more appropriate to the various occasions. In any case, the two that I prefer are the classical one for walking around the circle (also using laoseng tuobo) and Jinshe panliu. One of the things which greatly contributed to this change of formulations we did was that we had become conscious that the two arts of Bagua and Xingyi are really close. This started from the following observation. In Xingyi there is a technique, generally somehow neglected, called Hengquan, a fist striking transversally. Very well, when reading the classical texts of Xingyiquan we find that Heng is very important, it is in fact considered "the mother fist", the mother of the other fists of the Xingyi. Reflecting on this and considering how it is used in certain schools of Xingyi, as opening technique or fighting, I noticed its great versatility if used in beginning of practice. I further realized how, even though in a different form, it has a function which is typical of Bagua: to "surround" the opponent, to attack him on the side. This brought further reflections and gradually destroyed the mental barriers I had set for instance, between Xingyi and Bagua. Not only that: it has led me to demolish a lot of other barriers, also including different styles as Yiquan, Wingchun, etc... I have noticed the similarities and the usages. Is it better to be restriced or to be free? Why stay restricted when you can be free? Stances give way to the techniques. An art cannot build walls with which to confine itself. Besides, this would contradict the spirit of Change on which Bagua is based as a philosophy. This was already implicit in the life of the founder, Dong Haichuan, when he clashed/met with the Xingyiquan of Guo Yunshen. Since then, the two arts became allied, the techniques of one are present in the other and the stances are also very similar. Therefore, although in Baguazhang the use of the palms is emphasized, for a long time the fists have existed too. The classical fist of Baguazhang is fanbei chui, the backfist, but the fists of Xingyiquan were used too, especially in the Cheng school , while in the Yin school a lot of fists and kicks of the Shaolin kind were used. The second linear form, for instance, has maxiu lianchui, "chain fists rubbing the sleeves". Still you take a half-step to the side without worrying about it. (By the way I feel that the translation done by Huang Guoqi in the book Liang Zhen Pu Eight Diagram Palm (High View Publications, 1993, p.93) is inaccurate : 'Hand method in others is mostly in a straight line / walk a half step forward and wait leisurely/ Pointing straight forward for oblique punching / it is all right to walk another half step forward'. Here the translator has lost the meaning of the word kua which, in martial sense, means to take a footstep to the side and not "walk a half step forward". In addition, the translation of the last words, bu xiang gan, is not 'it's all right', rather 'without worrying about it' better reminds us of the attitude that the practitioner of Bagua should have). When he wants to turn I capture him. This "I capture him" doesn't refer to a Qinna technique, something which Bagua doesn't hold in high respect in the ancient texts (even if in modern times Li Ziming's school has developed a lot of Qinna techniques) but to a fast, temporary grabbing. Baguazhang emphasizes this proximity to the adversary, this rubbing of the two bodies (called moshen zhang, "Palms with the rubbing/grinding body "), for instance in song 27. It also says about the "centerline" (Song 30): "It is natural to protect the center", on which the commentary says: "Also, when the adversary is attacking with numerous strikes and from various angles, I have only to protect the center. Facing numerous strikes my hands should stay close to the body to provide constant protection and not stretch away from the body unless absolutely necessary and even then they should be drawn back as soon as possible". Walking around the circle, according to me, is to protect just the centerline . When the opponent attacks, a small rotation of the body is enough: the centerline of the opponent will be turned towards the void, ours will be directly toward him. To achieve this goal, the posture of jinshe panliu is pretty good. This article could be longer, but I intend to conclude here its practical part. I would like to state again that going around the circle (or also only using the "half circle") is fundamental in Baguazhang, it is the essence of the art. This is confirmed by all the texts and by all the teachers (even if practice is not always consistent with the premises). I believe that the careful reader will also have found, among these lines, many hints for its real practice. 2) BAGUA PHILOSOPHY AND NECESSITY OF THE CHANGE. I won't speak very much of this. I have always considered the "philosophical" part of Bagua as a superstructure mainly created by Sun Lutang (in his book Bagua Quanxue). On the other hand a certain underlying philosophy to the practice exists which is that of change: Also reading the "songs", the classics of the Baguazhang, we can find that there is a notable insistence on continually changing the footsteps to advance and to withdraw and on the continuous change of the hands. Therefore we cannot neglect completely the philosophy of the Eight Diagrams, mainly introduced in the famous oracle-book Yijing (an old western transliteration: I-King) or Zhouyi ("The Book of the Change of the Zhou dynasty "). This book is grounded on the continuous transformation of 64 hexagrams to foretell the future, or better said, the rules of behavior for the future. Since reality is in continuous transformation it comes as no surprise that Baguazhang is so different from teacher to teacher: it was taught according to individual predispositions of each student by Dong Haichuan and each student naturally transformed it entirely according to his predispositions. This is the reason Bagua presents itself as an open school. Unfortunately as the years passed, and due to "the teachers' cult" which is always present in the Chinese Confucian mentality (but also, and sometimes more so, in the western one) the art has often been reduced to a dead husk and, as all things in contemporary China, this is due to the evil influence of money: for these reasons a living and enlivening content has often been embalmed. For years I have transmitted Bagua exactly as I was taught. I now feel that this is a dead way. It is necessary to innovate, it is necessary to create. Certainly those are the forms, but regarding their practical applications, they very often had gone lost or are now obsolete and what remains is insufficient. Perhaps we again need to use the philosophy of Change (YI) and to do so starting with the very beginning from the princìples governing the art. These changes cannot be arbitrary, they must have rules governing them, and only the princìples (as in Taiji) can be the stone against which to compare them. This is one of the reasons that lately I reread the "songs" of Bagua, rediscovering them after so much time. Recently, for instance, looking at a recent book of Liu Jingru on the forms that he taught me I noticed many changes in them, and it is natural that this has happened. Putting it in terms of Buddhist meditation, it would have been the same as thinking that an art is a dead body, a substantial thing.... but it is not, an art is continually modified. A certain teacher and his students make me laugh when they say that their art is true bagua, not bagua-xingyi... Really? Then how do we take it when we see that one of the first techniques I saw this teacher use is JI, a tool (to Press) of Taiji? The reality is that in this world everything is influenced by everything and the people that deny it are often in self-contradiction. My philosophy of life is to move towards freedom, the Liberation. And this should go for everybody. Regarding Kungfu, the old Chinese saying is still valid: in the beginning you are free, then, when you start to learn you are not able even to go out of the door, you don't know how to do anything; until you return to freedom, but with quality, not the same freedom as the initial ignorance. of all these arts, a free container, perhaps even freer than Jeet kune do, which seems more and more lately to have become fossilized into a kind of kick-boxing, into "a school", which was certainly not the idea of its founder. Baguazhang is in particular easily inclusive of Xingyi and Taiji. We must not to set limits to ourselves and need to allow the bud under the snow to bloom into a flower. Today, as ten years ago, I am always fascinated by what you write. I cannot do anything else other than to fully share how much you write, and to add something. The concept of the circle is a vast concept. Since I began to work with more repetitions (and therefore in different times and with different perspectives, according to the personal maturity or simply at times of the most greater separation) on styles such as Bagua, Xingyi, Taiji, Yiquan, Wing Chun, Kali, Shuai Jiao, Shaolin, Tan Tui, Wu Shu etc. (this is some the synthesis of the perspectives), the conclusion is that "true" movement is smaller even than a circle. It's a point. As Wang Xianzhai said, it is in the immobility of the point that there is everything.Let me elaborate. If we consider the circle in itself and for itself, we end up doing as someone we both know, fighting championships while walking a cricle in a side guard, at which point the opponevt who wasn't tired, knocked him down without too much politeness. It doesn't work.If we consider the circle as side evasion, we are already very more there, because I clearly remember Wing Chun, in its applications which always have this obsessive idea of the central line, and only after a long time I have understood that what really is of interest it is not the center line but the way we manage it. Or, to go out and to attempt, therefore to use the strength of the opponevt to slip away (as you say for Bagua) and to strike. It reminds us of the art of the great teachers, from Ueshiba to Chan San Feng, doesn'it? If we consider the smallest evasion that exists, we realize that it is founded on a side micromovement performed by the limbs, a microturning that gives effectiveness and structure to the movement, and finally a micropush at the correct moment with the whole body behind, possibly with a certain dose of skill. Still, once again we are speaking of Taiji, but also of Xingyi, of Yiquan, and surely also of Baguazhang. It is also one of the main problems of Wing Chun, which often knows how to control the opponent very well but doesn't know how to express Fajing. The few exceptions (Wang Shun Leung for instance) were famous not only in Hong Kong. I remember that small technique, almost insignificant, but so beautiful, of the Sun style of Taijiquan, when Sun brings the hands to the center of the breast as if to sustain a small sphere. Insignificant, really is the correct word, but considering that every system in its methods must not only contain great martial truths, but also that which at a certain moment has to transcend martiality (otherwise what evolved system is it? Better to return to Thai Boxing), it is also a spiritual message. One point. We are v one point only. The expanded point becomes a sphere, and so Baguazhang represents with enormous likelihood the meaning of our life, which is continuous mutation and stability. Something like an atom with its electrons, which constantly change structure to connect themselves to other atoms to form matter, and constantly remaining centered in themselves not to lose their identity. We are light, and this you also know . Light has a double nature, wavy and corpuscolar. This is the classical puzzle for today's physicists, and on this simple analysis people as Capra or Zukav have built their approach to a new physics, that tries to keep in mind oriental mysticism. Not for love, but for necessity. Something escapes us. The duality Yin-Yang. The most interesting thing is that today, the most advanced psychology, based on the principles of Palo Alto and Neuro Linguistic Programming (NLP) are in reality at the extreme limits, among the most advanced therapies, to solve problems of the depths of human personality, but also methods for business (communications) as well as for self knowledge . Once more, to move forward we have to go back, or rather inside. The industrial methodologies to improve the production (of Japanese matrix, but in reality exported from USA after the war) are based on an added value that every single person inserts in his/her own job as a result of trying to do the best for himself. The results are amazing, and not directly correlate with the individual's own motivations. As if to say: in the field of spirituality 1+1 results in 11, not just 2. Baguazhang is a form of dynamic martial syncretism, in which the solutions emerge from the practical approach to movement. The lack of practicality is a problem in a lot of martial arts. Even many teachers of Xingyiquan have problems in applying with effectiveness the thin repertoire of techniques of their art and this makes me think of some deeper problem.. In a recent essay on the Yijinjing that I have presented in Scotland I wrote that the Yijinjing, in its "real"version , as it is for instance used by the academy of Chinese Traditional Medicine of Nanjing, is a method of transformation of tendons and marrows of tremendous difficulty, based on almost athletic performances of the body. I offer then that Chinese Tuina resolves a lot of pathologies!Many people don't want to know this aspect of the Qigong, preferring to stay in a circle that allows them to relax and to get well with calm, without sweating and with the feeling of being cuddled. Stress is a subtler and more destructive enemy than physical fatigue. Qigong itself has been turned into an endless series of movements. Which are the true ones? Those that we do "from inside." In the same way, I would speak so for Baguazhang and for every martial art. The meaning is inside the person, it is in its search, rather, in its daily personal odyssey, in its opening to dialogue and its determination to pursue its objectives. Which are the objectives? We also need here to be honest. Not all we were born for fighting in every moment of their lives. The veterans of Vietnam are not able to live a normal life anymore.Our ancient nervous structure of instinctive reaction is still founded on two principles, "fight or flight", you fight or you escape. Our daily life forces us to keep on mediating, to accept what we don't succeed in understanding, and to change what is possible to change, even if at times it is not the correct thing. In short, stress belongs to our driving car, to answering the telephone or in a line at the supermarket. This is where the contortions of the modern world are born. All is governed not by values, but from exploitation. There is no more space for that magic 1+1=11, everything has to produce at least 2, better 3, even also 4. But we have lost sight that it was easy with very little to produce 11. Here it is because it is necessary to return to do somehow the point of the situation. Baguazhang is also a school of growth. It doesn't care the style, it doesn't care the purpose, what serves is to be in harmony with ourselves. The search makes the free man, rich internally and it allows him to reach its purpose, that is equal for everybody. We want to be happy. Baguazhang, a way to the happiness? If you ago company for a whole life and if you try to understand the life through it, then yes. But this is pure philosophy. Getting back to practise. Without too illusions or expectation, that ruins us the present. The only true moment is that of the practice. To cross the arms is always a moment of growth and knowledge. It's very beautiful to think that to grow in the martial arts we are forced to make to grow another person for then to return to grow us. An embrace, this is what your article stimulated me to say. 2) a letter of Fabio Sandonà, Padua. Hi Loriano, I've read your new article "Things I have understood on the Bagua", I liked the sincerity (a lot of, in a Buddhist way well integrated) on your experience and search on this art. Me same continually (for what I am able) I am on the continuous search of the real content of this art and every lesson and weekend, I try techniques that if not effective then I leave. At times I deal even only with simplifying, at times to integrate with some small movement in more. I believe to have understood that this is the sense of the search and the change. However compliments!, to look for disproving and for more reality to make true an art (or perhaps all) that still hides behind mystical beliefs. In every lesson I try to transmit to my students to be the most possible true and vigilant, giving the correct weight to what they practise (no magic powers and mysterious strengths). I came to think however, that this is only possible with the help and the support of a spiritual run, or only ideological, of a "original"Buddhism.